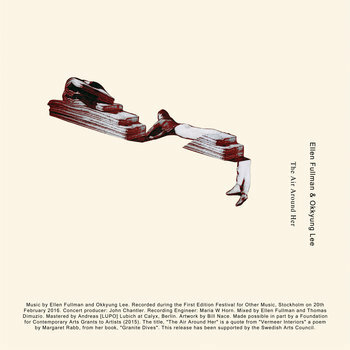 Brainwashed - Ellen Fullman & Okkyung Lee, "The Air Around Her"
Ellen Fullman & Okkyung Lee, "The Air Around Her"
This record documents music made by two women — one American and one Korean — who have both made a profound impact within experimental music. Ellen Fullman’s Long String Instrument has been a long-term life-work of incredible ambition and dedication. The result is immediate, exciting and inspirational. Okkyung Lee has completed rewritten the possibilities for the cello in solo and group improvisation whilst maintaining a steadfast defiance to the many attempts to contain her work within pre-defined genres. The Air Around Her was recorded on February 20th, 2016 during the First Edition Festival for Other Music in Stockholm, Sweden at Kronobageriet — the former bakery to Swedish Royalty that dates back to the 17th Century and is now the site of the city’s Performing Arts Museum. The Edition Festival was given access to the space while renovations took place and Fullman allowed the requisite time to install and tune her long string instrument along the full 26 meter length of the room.